Video interviews are quick, cost-effective digital recruiting tool that can help companies tap deeper into an ever-expanding talent pool. Unfortunately, time-honored hiring practices, such as phone screens, are unnecessarily time-consuming and require several rounds of interviews. But video interviews are a convenient recruiting tool that can narrow down this process into a few convenient steps. But not all digital recruiting tools are the same. Currently, there are two distinct types of video interviewing: Pre-recorded videos and live video interviews. So far, there has been scant research on the difference between pre-recorded vs. live video interviews. Live video interviews are a game-changing digital recruiting tool that allows the employer and candidate to conduct a live-streamed video interview anywhere on the globe. Generally, companies that are interested in video interviewing technology have a decentralized hiring process or widely dispersed recruitment force. As such, this interview platform can provide remote, face-to-face interactions that help businesses secure a better grasp on a candidate’s character and credentials. Pre-recorded videos have the applicant make a recording of themselves answering a set of pre-scripted questions. But the candidate has no interaction with a company representative. According to a study by Lighthouse Research, only 9% of candidates preferred pre-recorded video interviews. In the same study, live video interviews received 57% favorability. Recently, industry buzzwords like “candidate experience” and “culture fit” have made their way through many boardroom meetings. These terms reflect a new reality for hiring managers and recruiters. The recovering economy means that candidates have more job options and companies need to do more to attract top talent. Therefore, a proper examination of pre-recorded vs. live video interviews should reflect the current recruitment conditions. First, you need to understand how the “candidate experience” affects your business. Candidate experience: used to describe an applicant’s perception of a company’s hiring process. 80% of job seekers said they would take one job over another based on the personal relationships formed during the interview process. If your interview process is time-consuming and inconvenient, candidates may decide to move on to your competitors. Yet, video interviews can help streamline the hiring process. 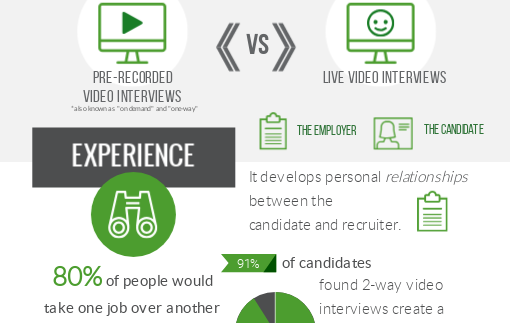 However, in the discussion between a pre-recorded video interview vs. a live video interview, which digital recruiting tool offers a better candidate experience? Live video interviews can help amplify the candidate experience by not only providing the convenience of interviewing from separate locations but also the benefit of interacting with a company representative. Over 91% of candidates found the video interview to create a favorable impression of the employer. Live video interviews encourage and facilitate a long-distance conversational exchange between the employer and candidate. This feature is vital for companies that are looking for more economical ways to engage and attract top performers. Because of high turnover costs, hiring candidates who don’t jive with your current system can be an expensive mistake. Companies cannot afford the high-cost of bad hires! According to research by CareerBuilder, 41% of employers estimated that a bad hire could cost $25,000. A Harvard Business Review study indicated that 80% of employee turnover is due to bad hiring decisions. What is a culture fit in the workplace? Culture fit: means a candidate’s and an employer’s values and beliefs are in alignment. A study found that 60% of recruiters say culture fit is the most crucial factor in deciding to hire. Companies interested in upgrading their recruitment process need a user-friendly platform that can help them to hone in on a candidate’s cultural compatibility. However, does ‘culture fit’ have a place in video interviews? Live video interviews allow you to see how candidates “think on their feet” and react in real-time. This innovative interviewing technology enables employers to better identify a cultural fit. In fact, five minutes of live video interviewing has the same predictive effect as a traditional 200-question assessment. Pre-recorded videos could help you to identify some cultural cues. However, with this recruiting tool, it’s impossible for the interviewer to ask follow-up questions. And, unfortunately, a hiring manager or recruiter could misread a candidate. Moreover, there is no way to tell if a candidate is giving a rehearsed or disingenuous performance for the camera. A close study of the struggle between a pre-recorded video interview vs. live video interviews has brought the truth to light. In sum, live video interviews clobbered the competition, beating out pre-recorded videos by providing a lethal combination punch of equal parts candidate experience and culture fit. At the click of a button, live video interviews can save you time and money. Furthermore, traditional hiring processes are bothersome and unnecessarily expensive. The average cost per hire to over $4,000. For many companies, the traditional hiring process was spent on travel, logistics, and paperwork – not candidates. To download the full Infographic. Any interview method should be a two-way street. A pre-recorded video interview is unnatural and awkward. In addition, they will likely require a follow-up conversation that further prolongs the time to hire. However, live video interviews can reduce hiring cost by 2/3 and is three times faster than conventional hiring methods. 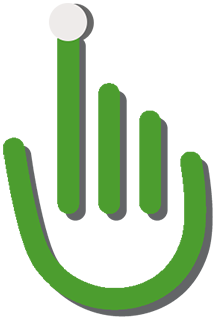 Moreover, this innovative recruiting tool can narrow the fill rate by 7-14 days and save at least $2,000 per hire. These features make the fight between pre-recorded vs. live video interviews is hardly a fair at all. Live video interviews are a knockout!! Yes, prior to conducting live video interviews with approved candidates, recruitment videos can be great for digital recruiting.